With a scenic beachfront setting on Banyan Bay, this lovely resort offers the comforts of home and warm hospitality. Spacious suite and villa accommodations offer plenty of room for the entire family, and feature kitchens, cable TV, WiFi and more. Enjoy magnificent views of the Caribbean seascape, from your private balcony or patio. Indulge at one of the finest seafood restaurants in Ambergris Caye, Pier 366, featuring glorious reef views, a lounge and more. Embrace the outdoors with activities such as diving, cave tubing, ziplining, snorkeling and more. 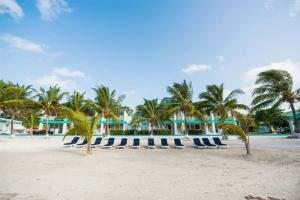 Located in Ambergris Caye, five minutes from the airport.